ATMOSPHERE!This being my first read by Brett McBean, I wasn't really sure what to expect. What I got was an incredibly vivid, breathtaking journey that I couldn't help but read in a single sitting! Everything from the "lore" to the characterization just sucked me right into this world. In case my heading wasn't clear enough, the atmosphere was almost a living, breathing, element in this superb story--the setting of the Dead Tree Forest was truly a character in and of itself. With every step forward taken, I could virtually feel the unsettling queasiness in my own stomach as I waited for what was about to unfold. I can't wait to look up other books by this author!Highly recommended! This is my first intro to Brett McBean. Overall, I liked DEAD TREE FOREST. The story was certainly compelling and there were a number of viscerally impactful scenes of horror and violence (particularly the last narrative unveiling the ungodly acts towards Ginumarra and her family). One other bit to this story I enjoyed was the aboriginal folklore element in addition to some of the aussie colloquialisms.I think the weakness in this novella (and key reason why I couldn't give it more than three stars) rested with the average character development. While, I thought McBean did a fair enough job with Ray, the rest of the supporting cast had a fairly superficial treatment and resembled similarly under-developed characters out of a James Rollins pulp thriller. Terrible things happen to all of the characters, and while I did understand Ray's motivations for doing the things that he did, I really never felt connected to them or even invested in their fates. The narrative certainly kept me engaged... kudos to McBean on that account... but it seemed like a vital spark was missing. I'll read another McBean story, as there was more than enough here to peak my interest in another novel or novella. 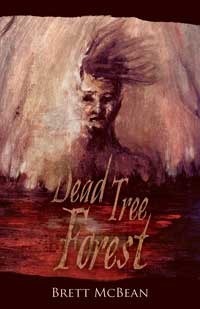 The Australian bush is vast and potentially dangerous, so imagine what it would be like if it were cursed.That's the premise posed by Aussie horror author Brett McBean in his latest novella Dead Tree Forest by Delirium Books.The story centres on a young aboriginal man named Chris who is forced to lead three treasure hunters into the wilds of Tasmania.Chris is more fearful about taking them into Dead Tree Forest than he is of being beaten by the thugs - and for good reason. More than a hundred years before the forest was cursed by a young aboriginal girl after white settlers killed her and her family.McBean takes us where we don't want to go painting a picture of a place devoid of life, yet brimming with death.This was the highlight for me, seeing the curse in all its terrible glory as it tormented the four men.The flashbacks to the aboriginals being terrorised also added considerable weight to the yarn.While the ending wasnt that hard to predict, McBean did an excellent job in the journey.It was also good to see the Australian landscape feature in a horror story and hopefully we'll see more in the future. A great read. I would have rated it four stars, except I had trouble buying into certain aspects of the plot. For example, in the story, it seems odd that the main character is willing to believe in the existence of the magic amulet, but not the curse that goes along with it. It's also odd that he kidnaps a local "abo" to use as a guide, when he probably could have gotten all the information he needed just by telling the truth. Then there are the story's mystical elements, which may or may not make sense depending on your perspective.Despite its minor flaws, this is a novella that will keep you interested. The writing is fast and lean, the plot imaginative and fairly unpredictable. Plus, the Australian setting adds a nice bit of flavoring. I have to say I really enjoyed this novella. Its about 70 pages long, but takes hold of you from the beginning and doesn't let up. Basically our main character, Ray has a daughter who is dying from a disease and decides (based on a legend) to venture into Dead Tree Forest in a last ditch effort to try to save her. Very well-written and lots of fun to read if you're a fan of horror. So put your backpack on and venture into the unknowing with Ray. You won't be disappointed. Great little read. Very Australian, yet not parochial in the slightest. Great read. Couldn't put it down. Don't read much horror this could convert me! Brett McBean - Brett McBean is an award-winning horror and thriller author. His books, which include 'The Mother', 'The Last Motel' 'The Awakening', and 'Desolation Game: Wolf Creek Book 2' have been published in Australia, the US, and Germany, and he’s been nominated for the Aurealis, Ditmar, and Ned Kelly awards. He won the 2011 Australian Shadows Award for his collection, 'Tales of Sin and Madness'. Along with a strong interest in music (he has an Advanced Diploma in Music Performance from Box Hill College) he is an avid film-buff and owns a vast (and ever-growing) movie collection. He lives in Melbourne with his wife, daughter and German shepherd.